I generally use a fairly small planner. It's a Franklin Covey compact (and one with a small footprint, closer to a Filofax personal than most FC compact planners). I can't carry anything heavier, but just like most people in a smaller planner, I run out of space if the day or week is particularly busy. 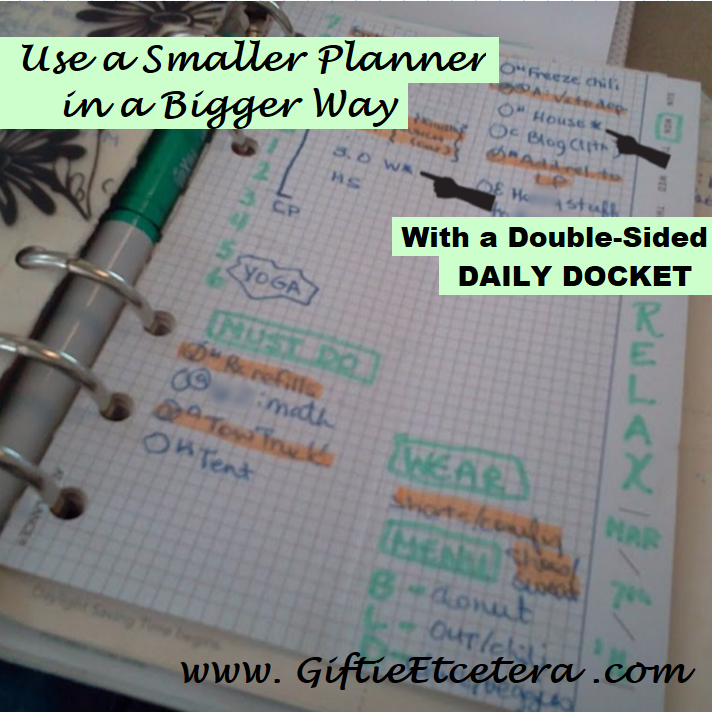 A great solution has been adding a daily docket to my planner as needed. That way, I have extra writing space on busy days. But something else is working, too. I add some information that is reference, but important, on the back side of the daily docket. Before, the back of my daily page was simply wasted space. Now, the back side includes these cool features. I fold each docket in half when I create it, to make a natural dividing line on the front side (as seen in the picture above). This also creates structure in the form of two columns on the back of the docket. TIP: Fold into quarters for more structure. Just line up the edges of the paper with each other to fold in a perfectly straight line. I've written about prep lists before. I like putting them on the back of the page because 1) they are long and take up a lot of space and 2) because I can fold them over so I see them as I check my planner to leave the house. Once I'm done, I just fold back. TIP: If your prep list rarely varies, use a sticky note to move from week to week. Sometimes I write stuff on the front of my daily docket that needs to be there. For example, in the picture below, I needed to do a couple of work items. However, the actual list of items didn't need to be on the docket. I did need to note them, though, because my usual work projects (keep on my planner project pages or, if computer-based projects, on OneNote) are detailed, but this time, I needed to write a time-sensitive letter and do a time-sensitive time sheet. TIP: Time-sensitive stuff ALL goes in the planner on the main pages, no matter what is listed in the project pages. To make sure I don't forget to look at the list, I draw an asterick mark (telling me that additional information is available when I turn the page). Everyone has a list of things that they want to get to, soon, when piddling around the house. Right? It's not important enough for the main page. But you forget to look at it if it hides in the project pages. Solve this by drawing an asterisk next to a key word ("house," in my case) and putting the list behind the daily docket. By the way, I don't do all that house stuff on the same day. I just do whatever is most pressing during my 15-minute quick clean. If you wondered where I got the planner supplies pictured here, I've included this handy list. 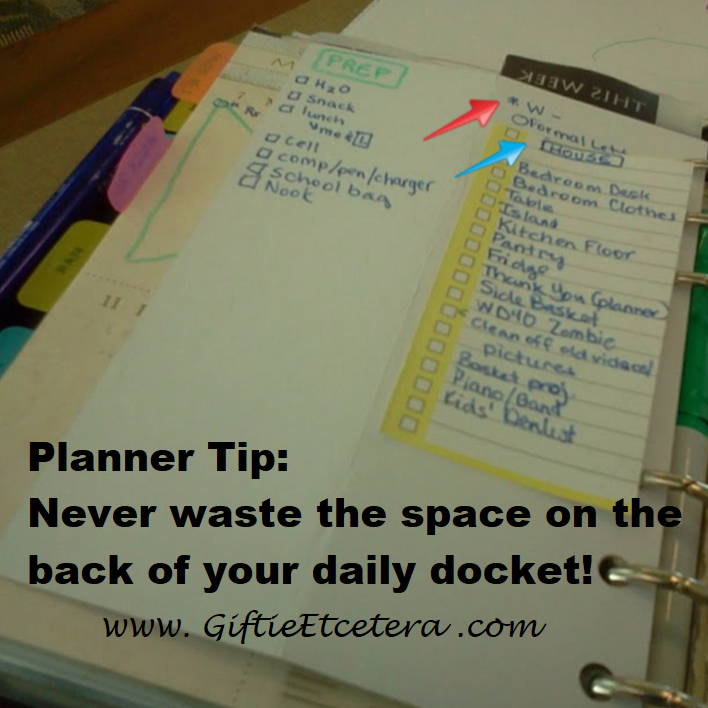 *My daily docket is made from At-A-Glance planning cards. I just hole-punch them when a daily page is needed. *The green marker used in setting up my daily docket is a Frixion marker. They write too thick for actual planning but are perfect for drawing, coloring, and setting up the page. They do not bleed through and are completely erasable. *Most of my readers will recognize a Day-timer hot list that I use for my ongoing household to do list. I wish these came in other colors!